Allotment result is published, candidate can login and pay their fees, and download their allotment letter. 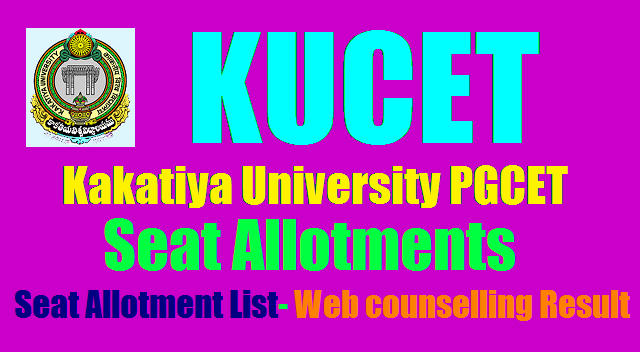 KUPGCET 2017 admissions 1st phase Seats Allotment list download : Kakatiya University, SU(satavahana university) PGCET 2017 admissions 1st phase Seats Allotment list download/ Telangana KUPGCET 2017 admissions 1st phase Seats Allotment list download: KUPGCET Seat Allotment Order 2017 : kupgcet college wise allotments, kupgcet first phase seat allotment 2017, kupgcet seat allotment order 2017, kupgcet web counselling results 2017 Download Kakatiya University (KUPGCET) Seat Allotment Order 2017 @ official website www.kupgcet2017.com Directorate of Admissions (DOA) Kakatiya University is going to release Kakatiya University Post Graduate Common Entrance Test (KUPGCET) First Phase College Seat Allotment Order 2017. So many candidates are eagerly searching for this allotment. So all the candidates can check and download from this page. KU PGCET 2017 is a common entrance as Post Graduation Common Entrance Test. Kakatiya University, the Directorate of Admissions Department issued the KU PGCET 2017 notification on 08/04/2017. The University invited online applications from the eligible students from 12-04-2017 to 10-05-2017 for admission into various PG Courses offered by the university and its affiliated colleges in the Telangana state for this academic year 2017-2018. The KU DOA conducted all entrance exams of KUCET 2017 as per the time table/ schedule from 17-06-2017 to 24-06-2017. Applied Candidates were appeared their entrance exams and they were checked their results on 14-07-2017 from kucet web portal. KU PGCET has successfully conducted the First Phase counselling process . Now the board will be soon release PGCET First Phase Counselling results. The details will KU PGCET 2017 Seat allotment order download. Directorate of Admissions (DOA) Kakatiya University conducted KUPGCET Entrance Exam for admission in to various PG Courses like M.A/ M.Sc/ M.Com/ M.Ed/ M.Li.Sc in Kakatiya University & its affiliated Colleges.The Counselling of the same was completed.Now the students who participated in the web counselling are waiting for the seat allotment order.Direct link for downloading the seat allotment order given below page. 4. Enter Your KUPGCET Hall Ticket Number, DOB & Password. 5. Then Click on Submit Button. KUPGCET 2017 officials have announced the first phase seats allotment list and placed on its web portal. The candidates, who were got seat, they should attend to the allotted college with your original certificates on or before (mentioned date in your allotment order). The Candidates also received the seat allotment information through SMS by the KUDOA. Candidates should download their seat allotment letter on KU Admissions website.